Anyone interested in learning more about this form of personal prayer should call Barbara Hall at 520.625.4319. Exposition of the Blessed Sacrament allows visitors an opportunity to spend time in quiet prayer with Jesus Christ present in the Blessed Sacrament. See the home page for times. 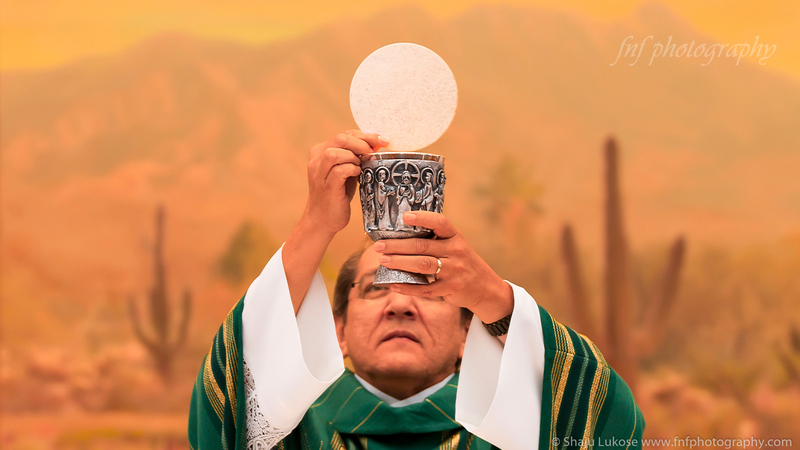 To commit to adoration at a specific time and day, please contact Deacon Joe at 520.625.4536 Ext. 112. These groups meet in individual homes where they read and discuss the upcoming Sunday scripture readings. This group provides service to the sick and homebound by visiting and praying with them and taking the Eucharist to the homebound. They also recite the rosary at wakes and before funerals and memorial services. The Legion meets on Mondays from 8:45 - 10:15 AM in Rm. 208 of the Holy Family Center. Become a TRUE FRIEND of those in care centers and retirement homes. This group meets weekly to pray the Chaplet of Mercy and the rosary for individual needs as requested by parishioners. They meet weekly on Tuesdays after 8:00 AM Mass in Rm. 225 of the Holy Family Center. All are welcome. The parish library provides spiritual and theological resources to the parish family. It is in Rm. 209 and always open when the Holy Family Center is open, Monday through Friday from 8:00 AM to 3:00 PM. You can browse and use the self-checkout system to borrow books, CDs and DVDs. Parishioners are given the opportunity to solicit prayers and support for their special needs and intentions. Email your request to olvprayerministry@cox.net.